January 16, 2011 January 13, 2018 P.O.P. So Why Are They Blaming the Nice Little Tea Party for Those Nasty Shootings? Hardly had the cyber-ink dried (or whatever cyber-ink does) on the last post, touching upon the patriotic posturing of today’s right-wing zealots, when the news broke of the Tuscon tragedy and its repercussions. Whenever such an episode of gun violence occurs, there are at least two responses that are very predictable. First, the NRA and its cohorts will rush to the defense of whatever weapon was used, insisting that “guns don’t kill, people do” (apparently believing that all those bullets were fired by bare hands) – even though, thanks to their tireless efforts to make firearms easily available, the line between gun and gunman has become hopelessly blurred. And second, the media will try to fit the incident into some kind of pattern, some kind of narrative. The big question that has been thrown around over and over again is this: were the assassin’s actions in some way attributable to the poisonous polemics that have become the norm in the American public forum? Right-wingers, naturally, were quick to answer in the negative, and bolstered their case by pointing out that in addition to being fond of such right-wing reading matter as “Mein Kampf”, the gunman was also known to read Marx. So obviously he’s a librul, huh? In fact, he doesn’t appear to have been particularly motivated by ideology at all. He was obviously quite disturbed, and theoretically the violence could have happened to anyone at any time, anywhere. But is it really just chance that the victims were a Democratic congresswoman and her supporters? Or has right-wing invective been ratcheted up to the point that non-right-wingers are bound to be the target of violence? Considering that the gunman was so disturbed, isn’t it likely that he was susceptible to suggestion? And if he was exposed to media rhetoric at all (which is all but certain), isn’t it probable that he was exposed quite a bit to Fox “News” and other purveyors of the constant message that “liberals” are evil beings who must be exterminated? So what’s so far-fetched about the suggestion that Palinesque polemic egged him on? In just the first 3 months of 2010, there were 42 security threats against members of Congress. All were Democrats. Just coincidence? And the wording of the threats often echoed Tea Party talking points. Just coincidence? Gabrielle Giffords herself had previously been the object of many such threats. Still coincidence? The election of a black Democratic president has sparked such a spike in threats of violence that the Secret Service is too swamped to deal with them all. Mere coincidence? 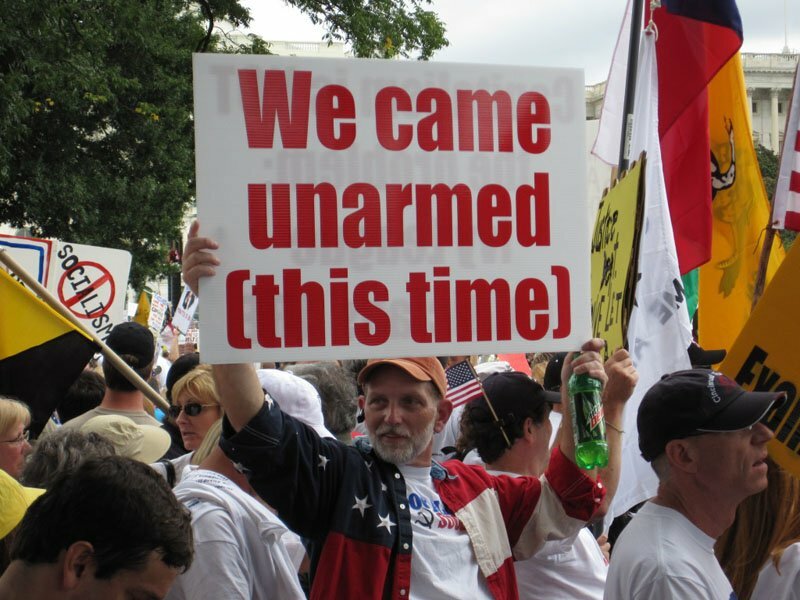 During the first few months of 2010, death threats against members of Congress rose by 300 %. Also coincidence? The real question then is not whether hateful rhetoric actually did prompt the killings, but whether it might have; in other words, whether it might do so in the future. And we already know the answer to that question. There have been at least three attempted violent attacks on “liberal” figures that were directly inspired by the frenzied, deliberately misinformed rants of Glenn Beck alone. The murderer of Dr. Tiller in Kansas apparently was inspired by Bill O’Reilly’s demonization of the victim as a “baby killer”. A gunman who opened fire in a Tennessee church stated that he wanted to kill all 100 people singled out in a book by Bernard Goldberg, another talking headless at Fox. A Pittsburgh man who murdered three policemen was motivated by the fear that the government was going to take away his guns – a paranoid fantasy frequently peddled by Fox, which he watched regularly. And lest we forget, the Oklahoma City bomber was a right-wing radical who spouted the same “anti-government” (i.e., anti-Democratic) worldview as these media figures. Nasty bickering over ideological differences is certainly nothing new. But today’s Republicanoid rhetoric has gone way, way WAY beyond incivility, beyond ridicule, beyond anger, even beyond hatred. It now operates in the realm of what is known as “eliminationism” – i.e., the attitude that those who disagree with you are very real threats to life and liberty who must be removed by any means necessary. But that’s only half the equation. The other half is that this political faction is closely linked with a creepy subculture that glorifies, even idolizes, guns. Combine those two elements and you’re bound to have an explosion eventually. Is it really so far-fetched to think that even the shooter in Tuscon might have been to some degree influenced by this toxic brew? Inevitably attached to the media discussion about nasty polemics is the knee-jerk defense that “both sides do it”. It just ain’t so, not by a long shot. Oh sure, you’ll occasionally find a left-winger who spews hatred, or who threatens or even commits violence. But with right-wingers it’s not just an occasional thing. It’s deliberate standard operating procedure, 24/7, day after day after day after day. And there’s nothing the least bit subtle about it. Keith Olbermann, who’s generally regarded as the most strident pundit on the left, actually apologized for something he’d said that might be taken to be hateful. The day Beck or Limbaugh or Coulter or O’Reilly or Hannity or Malkin does that, better take cover to avoid being smothered by the droppings from all the flying pigs. In a truly bizarre twist of irony, one of the Arizona shooting victims who vented his rage against a Tea Party official by making a threat similar to what Tea Partiers make with impunity on a routine basis, was arrested and submitted to psychiatric evaluation. When called on the carpet for such remarks, these characters often insist that they were just joking – even though jokes generally are at least marginally funny. Freud would have a field day analyzing how their “humor” is almost always expressed in the vocabulary of violence and hatred. Another thing you can predict with uncanny accuracy is that whenever the extremists get called out for their hatemongering, they will deny, spin, evade and – inevitably – shift the blame to “liberals”. Before the shooting, Sarah Palin urged her followers to “reload”, and put images of crosshairs with names on a map. Afterward, she insisted that they were not really crosshairs at all; and yet she promptly took them off her site -why was that? The predictable reply is that she didn’t want anyone to misinterpret after the fact. But wouldn’t it have been just as easy for someone to “misinterpret” before the fact? And then, ever the hand-wringing victim of the “lamestream media” (which in fact promoted her like the greatest thing since toothpaste, even before she became one of its highly paid components), she raged about how libruls were out to get her with “blood libel” – a term that probably was not deliberately offensive, but just typically clueless. Meanwhile, Rush Limbaugh declared that the assassin had the full support of the Democratic Party (even though the prime victim was one of their own). The head of the Tuscon Tea Party said that getting shot was Giffords’ own damn fault. Media talking heads lambasted “liberals” for supposedly exploiting this tragedy for political gain – even while the Tea Party Express was evoking the incident in fundraising emails. Many suggested that the whole thing might not have happened if only libruls hadn’t tried so hard to take away our guns, and everyone at Safeway had had one so we could’ve had a good old-fashioned Arizona shootout. (In fact, Arizona has some of the most lax gun laws in the universe, and firearms there are more abundant than rattlesnakes.) Bill O’Reilly, who apparently never listens to his own network or even his own words, fumed at those who dared question his brand of discourse as “merchants of hate” whose actions are “unprecedented”. In my endless exploration of propaganda, I recently came across a website that promises “conservative commentary with an edge” (Is there any other kind of “conservative” commentary these days?) on which the moderator indignantly denied that any leading right-wing politicians had uttered incendiary statements. I promptly enlightened him about a few that readily came to mind, including Tea Party fanatic Sharron Angle, who very nearly was elected senator in Nevada after urging voters to “take out” Harry Reid and mentioned “Second Amendment remedies” as an option when you don’t get what you want. Well sir, he really went on a tear then, declaring that I was obviously one of them moon-eyed libruls, and I was quoting her out of context because she clearly was referring to arming yourself in general against guvmint tyranny (such as, oh, the current administration) and meant that you should FIRST try to take out Reid at the voting booth, and how could I be such an idiot as to think she was actually encouraging violence against elected American officials. Despite the well-demonstrated futility of attempting a real discussion with a frothy-mouthed ideologue, I couldn’t resist asking just, um, what country he thought “Second Amendment remedies” alluded to, anyway. Within days of the massacre, as Gabrielle Giffords lay fighting for her life, fans of Sarah Palin weighed in on a Facebook page, and one had this to say about the 9-year-old girl murdered in the attack: “Christina Taylor Green was probably going to end up a left wing bleeding-heart liberal anyway. Hey, as “they” say, what would you do if you had the chance to kill Hitler as a kid? Exactly.” If you think the other commentators reprimanded her, think again. The next comment was about how “liberals are gong to use this as an excuse to take away all guns.” These folks haven’t just drunk the Kool-Aid, they’ve been baptized in it by total immersion. And sooner or later you have to wonder what kind of ideology would attract such life forms in such large numbers. For while it’s certainly not fair to judge any group by its dregs, these sentiments are all too typical of what you hear expressed at Tea Party gatherings, and by the faction’s political and media leaders. For a very short time, it looked like there was going to be an era of civility, sanity and mutual respect in the wake of this tragedy. (Even Glenn Beck posted an appeal to stand against violence – next to a photo of himself brandishing a pistol in an attack-ready pose. You think we’re making this up?) But needless to say, it was very short-lived. The venomous rhetoric will continue, and so will the violence and threats of violence. It’s just too profitable to give up. Eventually, there probably will be a massacre on a much larger scale, and odds are that such an incident might include a right-winger or two among its victims, if only by sheer chance. Then and only then, perhaps, they’ll finally start to look at the root of the problem. And they’ll no doubt conclude that it must be gay marriage. We can only hope and pray she makes a recovery so that Justice can be rendered against her. Had it not been for the negligent actions by Giffords in not having adequate security present after having had substantiated threats documented, she is responsible to the deaths and the injuries to so many of those victims imo. Thank you for your comment. I could talk all day about how effective propaganda is, but it’s much more instructive when readers have a chance to see it for themselves. Heya i’m for the primary time here. I came across this board and I to find It really useful & it helped me out a lot. I am hoping to give something again and help others such as you aided me.